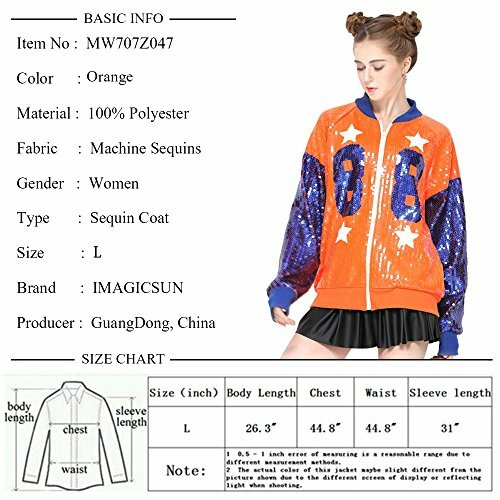 WHY CHOOSING IMAGICUSN BOMBER JACKET/ LIGHTWEIGHT JACKET/ SPARKLY CARDIGAN ? 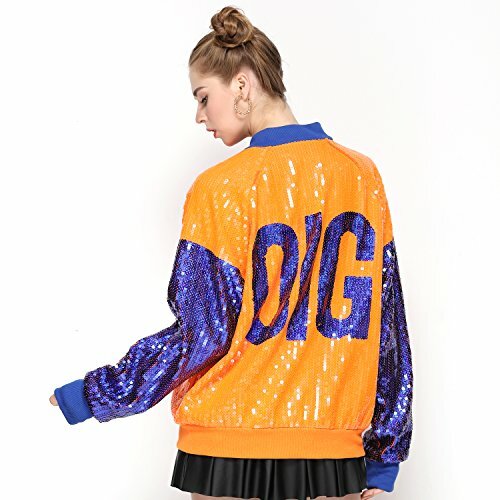 looking for a sparkly bomber jacket/ glitter cardigan/ varsity jacket for your dance, club or night out? The IMAGICSUN zip-front jacket/ active jacket/ casual jacket / sparkly cardigan is the perfect choose companion! Unlikely poor and squeeze sequin bomber jacket that add to your burden, our vantage sequin coat is STRETCHABLE AND BREATHABLE ! The glitter sequin coat makes a great choice when picking for holiday, party, club, date,evening,dance,casual, hang out etc. 1. All the sequins are well sewn on the mesh, it will not fall easily when you are moving your body or doing others. 2. A piece of soft and smooth lining well protect your skin from sequins, breathable and stretchable. Soft ribbed and cuff. 3. Durable zip are made in good materials, it help this sequin jacket coat to show your slim body and it will not jam shut easily. 4. All the sequin jackets are made in high quality materials, comfortable and sparkly, your beauty will not be duplicated! 5. Backed by 30 DAY MONEY BACK GUARANTEE when purchased from IMAGICSUN ONLIN STORE, RISK NOTHING! With 20 years experience on women/ girls sequin dress, sequin T shirt, sequin jacket coat study and research, we insist on providing the strongest sequin clothing! ♥♣SKIN FRIENDLY MATERIALS: Our sequin jacket made by 100% brand new sequin&soft lining, soft touch! Soft ribbed collar, sleeve cuffs and hemline well protect your skin from sequins. ♥♣DURABLE ZIPPER CLOSURE: Our zipper was made in good materials and it will not jam shut easily. You also can open the zip to wear our sequin jacket as a sparkly cardigan. ♥♣SOLE: One size only and fits most of you ladies. Body length-26.3", Chest-44.8", Waist-44.8", Sleeve length-31". Our letter jacket are unique and shining. ♥♣MULTIFACTIONAL: Our metallic jacket also can be wear as club wear jacket, dance jacket, disco jacket, track jacket, sporty jacket, night out jacket, performance costume etc. ♥♣GARMENT CARE：Hand wash cold recommended, hang to dry and turn over to protect sequins. Our sequin bomber jacket are available to fold for storage. If you have any questions about this product by IMAGICSUN, contact us by completing and submitting the form below. If you are looking for a specif part number, please include it with your message.